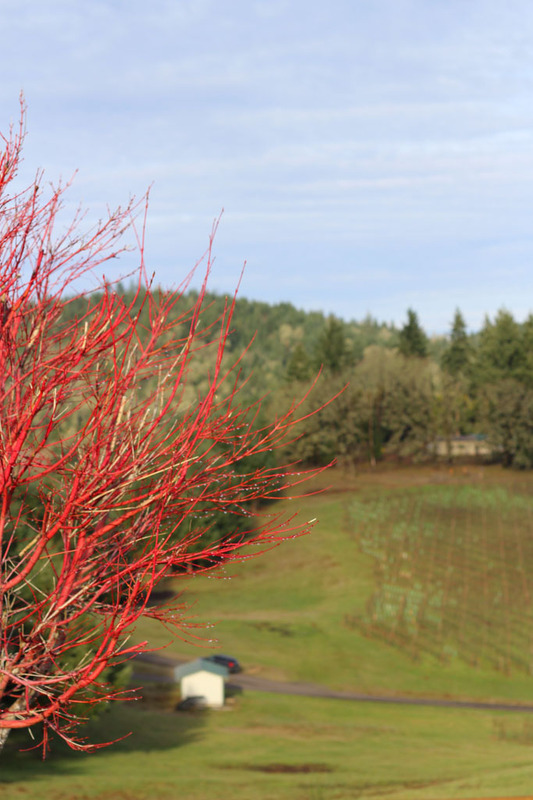 Wine Tasting in Eugene, Oregon in the heart of the Willamette Valley. 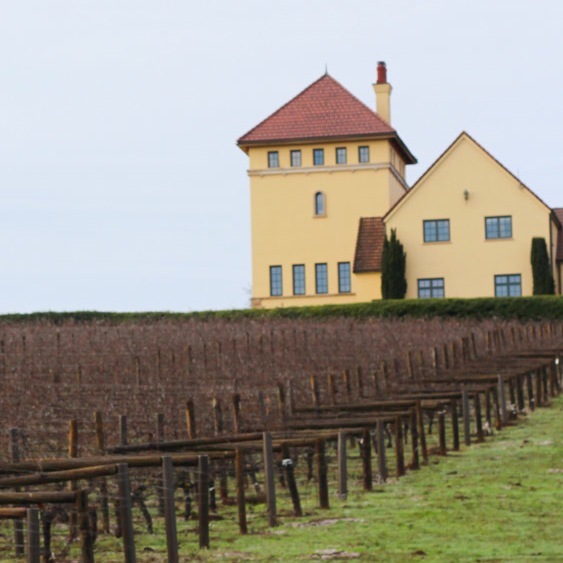 King Estate, Sweet Cheeks, Sarver, and Oregon Wine LAB are just a handful of wineries not to be missed in the area. Rick and I recently had the opportunity to head back to our old stomping grounds, in Eugene, Oregon. We both went to college at the University of Oregon. I lived there for 15 years, moving up here to Portland just a couple years ago. Rick actually grew up there. We both love it and couldn’t wait to head back and do a little bit of re-exploring. We love this town and talk frequently about moving back some day. I especially think about it when it takes 40-mintutes to drive into downtown Portland for work in the morning! I miss the Eugene traffic – It takes 15 minutes max to get anywhere within the city limits. I also miss the people, the small locally-owned restaurants, and the looping paths along the river. 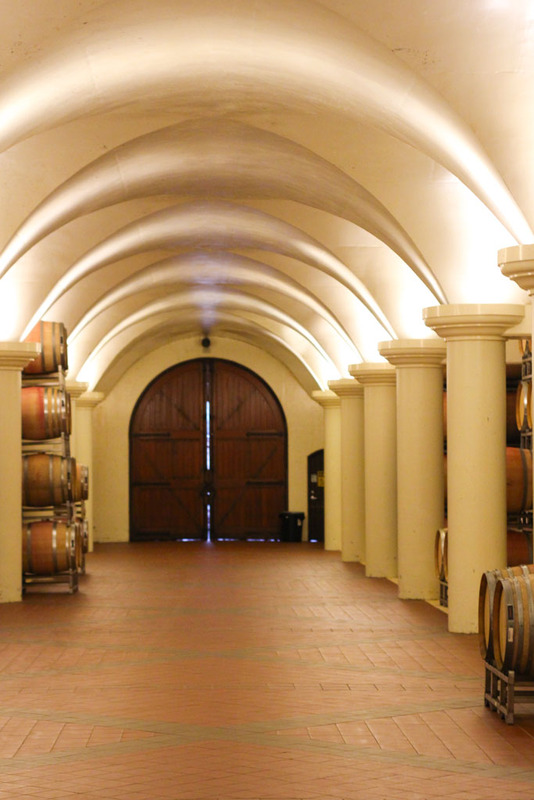 And let’s not forget the wineries. There are only a handful of them, but they are definitely wonderful spots to visit. On this visit, we were able to check out several of our old favorites, and one new spot that I’d not yet been to. We started with my long-time favorite, as it is the furthest outside of town – King Estate. You’ve probably heard of them, and perhaps even spotted their Signature Pinot Noir or Pinot Gris on grocery store shelves. Two things you may not know about King Estate: (1) The Estate (Domaine) wines are all made from organic grapes; (2) It has hands-down the best food to be found in Lane County (IMO). On our drive down from Portland, I let my dad in on what we’d be checking out on our visit, as he used to live there as well. When I mentioned King Estate, and asked if he remembered it. He said “Yeah, that’s some of the best food I’ve had in my life!” A statement which means a lot. But, it may mean even more to you when I let you on the fact that my dad travels internationally at least once a month. 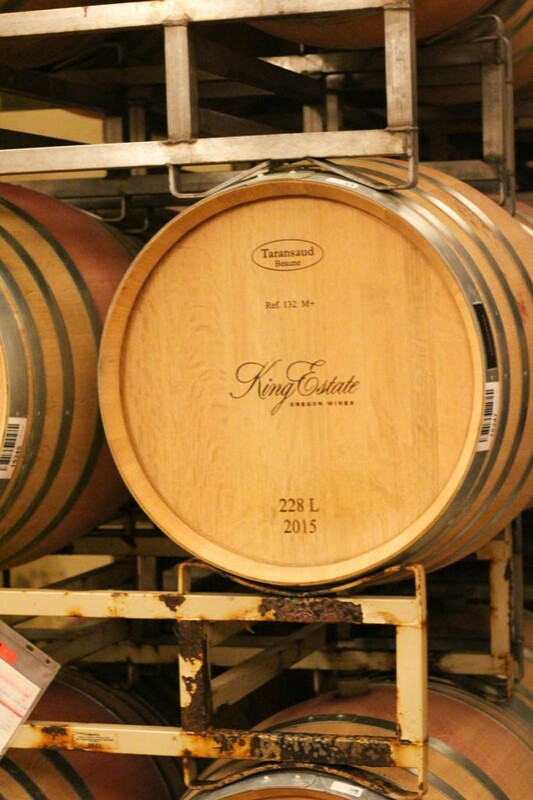 King Estate – You’ve got a big testament there! Bob greeted us in the tasting room and immediately won me over by pouring us some bubbles. Yep! 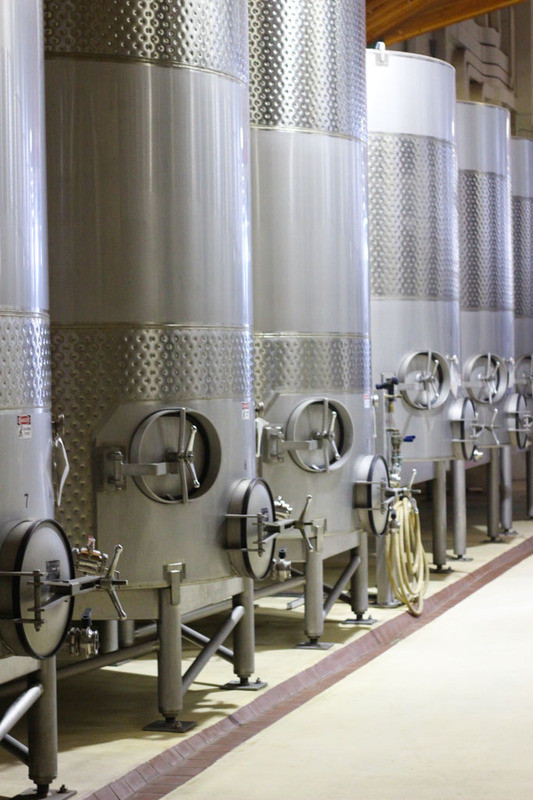 King Estate makes sparkling wine. Their Blanc de Gris dances on your tongue with flavors of light citrus and a backbone of biscuit notes. With glasses in hand, he led us through a tour of their spectacular wine production area. After our tour – We were treated to a tasting of some of their lovely wines. Starting with their Pinot Gris (I particularly loved the 2014 Backbone Pinot Gris – $24), Pinot Noirs (huge fan of the 2013 Signature Pinot Noir – $28 & available in stores! ), and heavier reds produced under the NxNW label – Walla Walla Syrah and Columbia Valley Cabernet Sauvignon. As if this tasting tour wasn’t amazing enough, the magic was yet to come – Lunch! 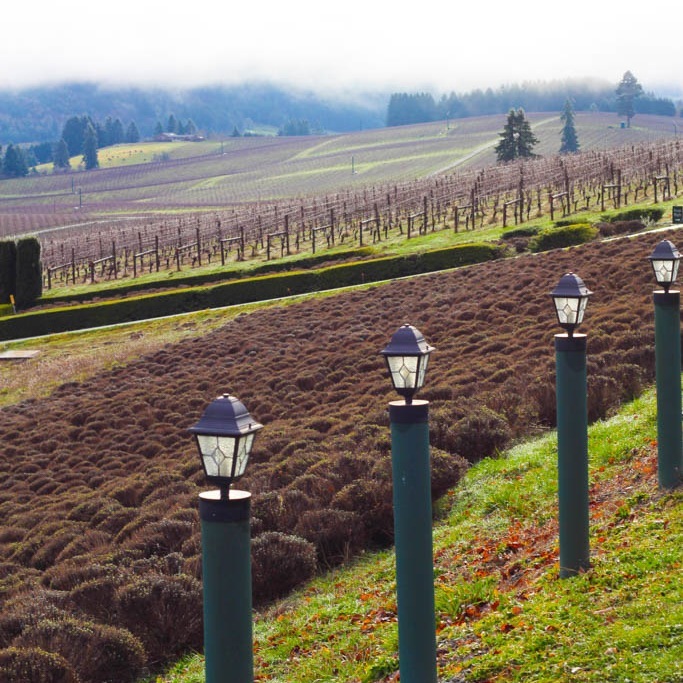 King Estate has an onsite restaurant that is out of this world. They also grow most of their own produce in their organic gardens that are located on the grounds. 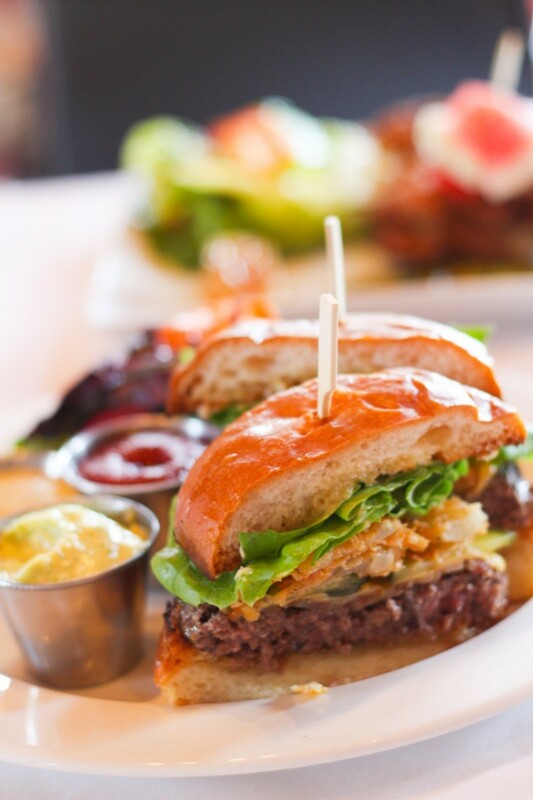 For lunch we noshed on Oysters on the Half Shell with Pinot Blanc Mignonette and Citrus Air, the Estate Burger with estate bacon, aged cheddar, butter leaf, estate pickles, tobacco onions, and black pepper aioli, and the Country Fried Chicken with pickled watermelon and honeycomb. I was in heaven! Everything was the best I had ever tasted. 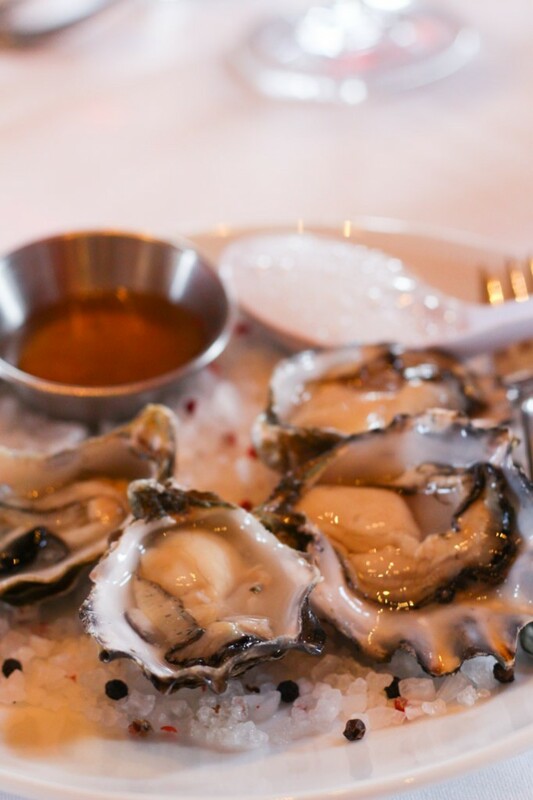 The oysters – Even the ones we get at our favorite beachside restaurant (steps from where the oysters are harvested) – These were better. The burger – A long time favorite of mine. Hands down the best burger you’ll ever eat, plus the ketchup, and the fries, it’s ALL good! (Hint: You can share this one.) 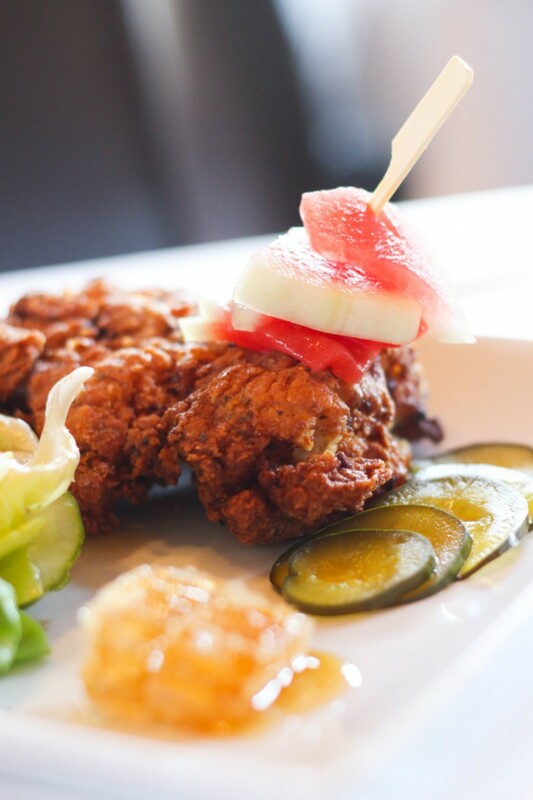 The fried chicken – I really appreciated that it was boneless, and it was the juiciest, crispiest, most well seasoned chicken I’ve tasted. I didn’t want to leave. But leave we must. It was on to our next stop. Sweet Cheeks is just a quick drive from King Estate. Since the last time I’d been there, they had enclosed their open air patio for the winter, making for a lot more room, which is a good thing, because it was packed! Sweet Cheeks is located atop a slope in the middle of farm country, which actually looks like a “behind” – Hence the name “Sweet Cheeks”. The view is spectacular and it’s a favorite spot for enjoying a picnic when the weather is warm. Today it was 40 degrees, max – But the warm hospitality, and tasty wines, did a good job of making us feel comfortable. 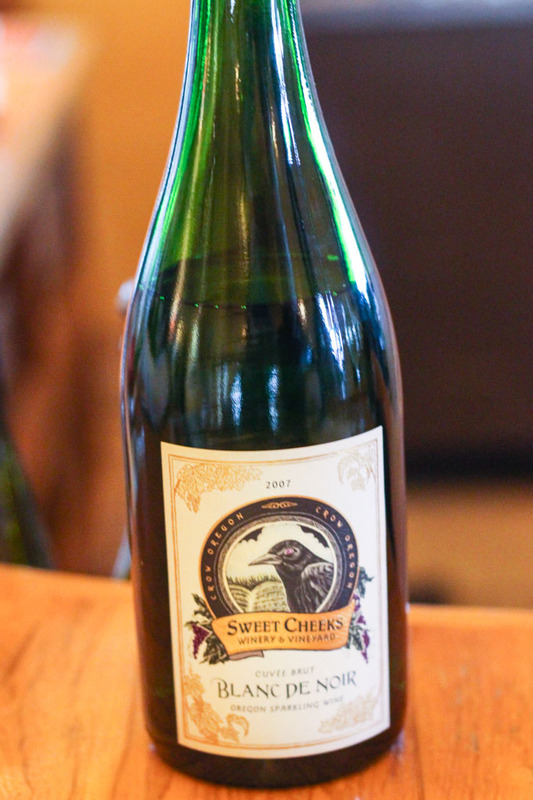 Sweet Cheeks also produces a sparkling wine. Their 2007 Blanc de Noirs ($30) was creamy with a bright citrus finish. I purchased a bottle to take home. Their 2012 Dry Riesling ($17) and 2014 Rosy Cheeks ($18) also went home with us. Rosy Cheeks seems to be one of their most popular wines. It’s definitely easy drinking. A bit sweeter than a dry rose, but with similar notes of strawberry, citrus and cherry, it’s perfect for enjoying in the warmer seasons. New since my last visit, I found that they are now also pouring a Dry Rose. I however, actually preferred the sweeter Rosy Cheeks. 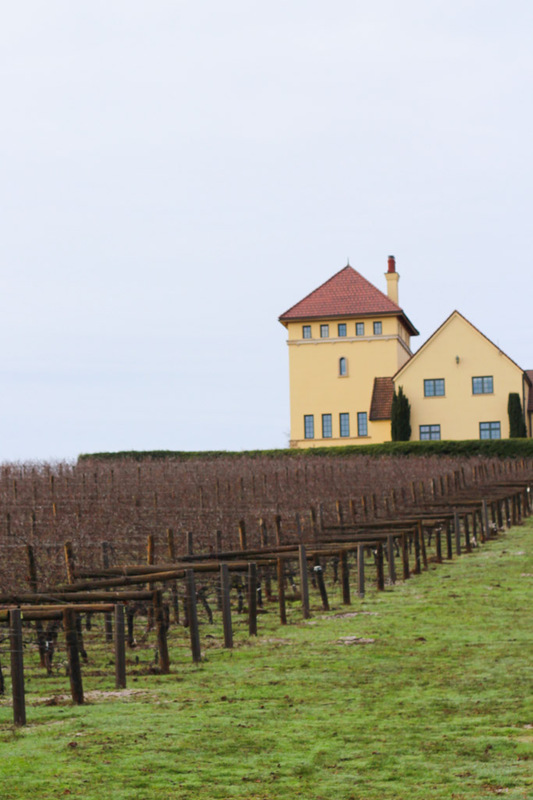 If you have time, be sure to make your way across the road to check out Silvan Ridge Winery. They’re pouring some great Pinot Noir and Pinot Gris, and be sure not to miss their effervescent Early Muscat. Leaving Sweet Cheeks behind, we headed a bit higher in the hills, and closer in to town, for Sarver. 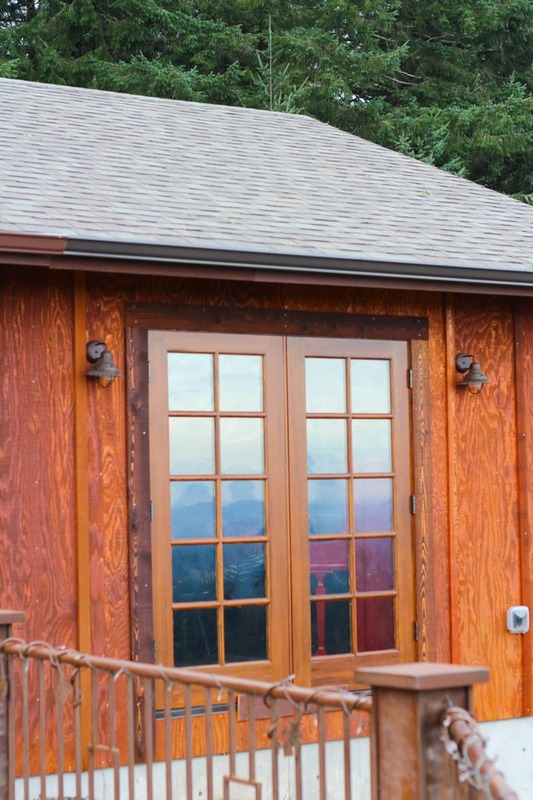 Sarver feels a bit like you’re in a cozy cabin in the woods. With it’s sweeping tasting bar, and views of the hills and a nearby pond, it’s easy to sink right in and spend a bit of time here. 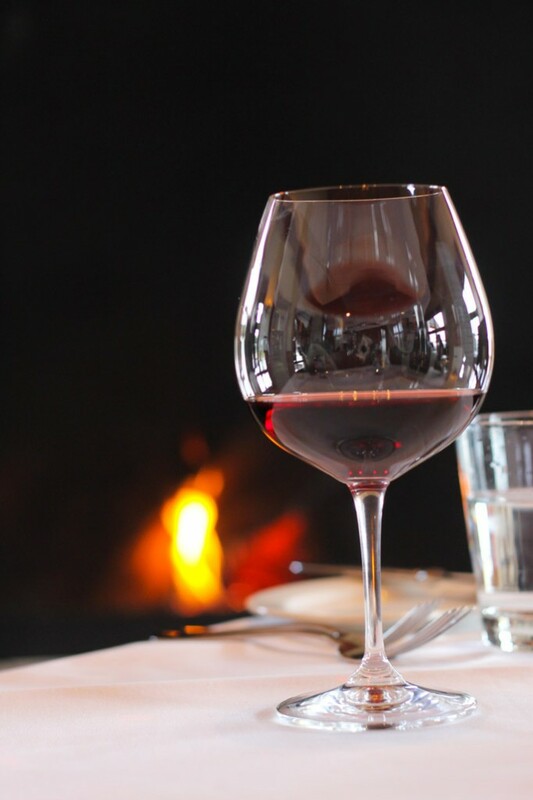 The standout wine for us was their 2013 Estate Pinot Noir ($28) – Light bodied with earthy notes and a cherry finish. 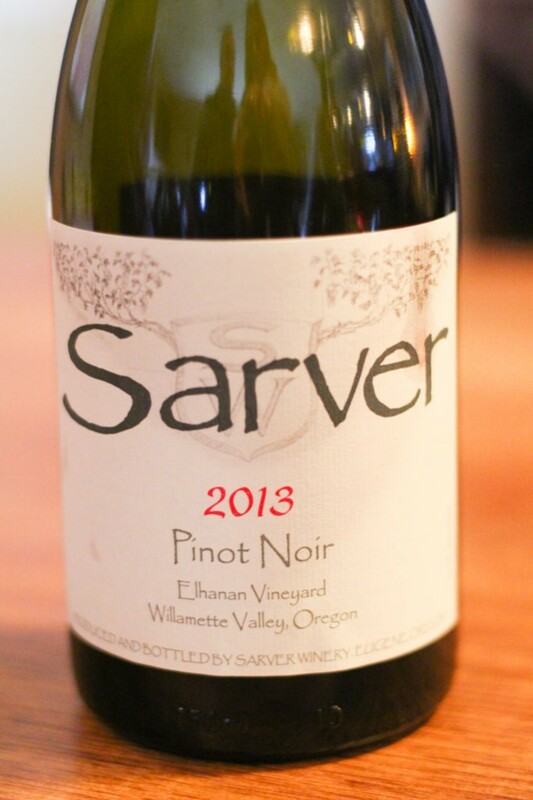 Everything a great Oregon Pinot Noir should be. As it became later in the day, we decided to head back into town and regroup at our hotel. The Inn at the 5th is located smack dab in the middle of downtown Eugene. We love staying at this hotel because it is in walking distance to the river and lots of great restaurants. The service is always spectacular and our labradoodle Sammie is welcome to say with us – Which is important when you have the Most Spoiled Dog in the World. 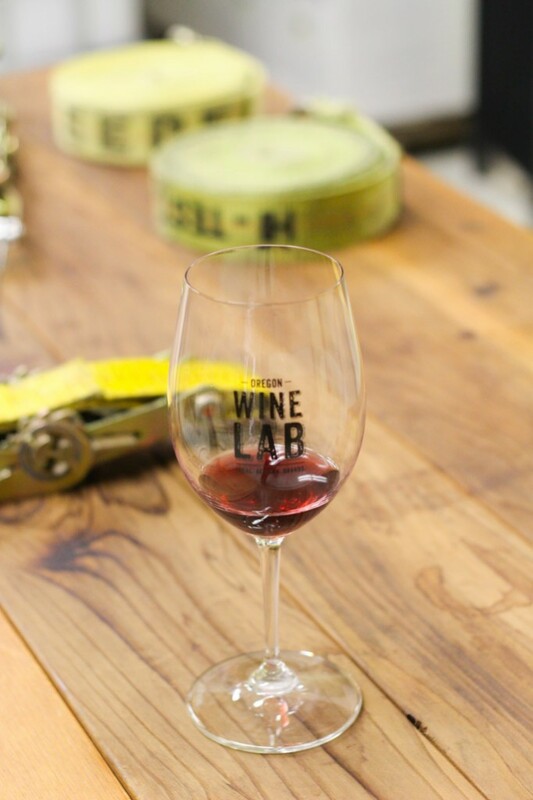 From the hotel, we were able to walk just a few blocks to the Oregon Wine LAB, an urban winery and tasting lounge. 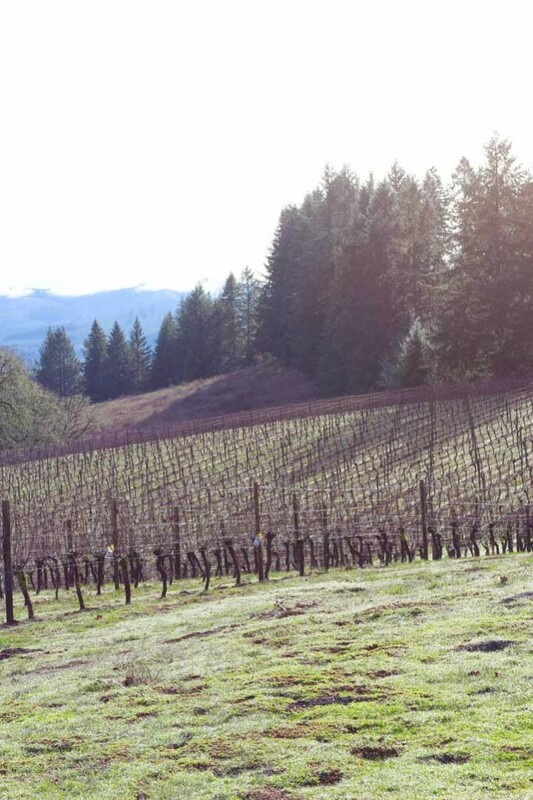 We had the pleasure of tasting and chatting with The Oregon Wine LAB’s proprietor Mark Nicholl. 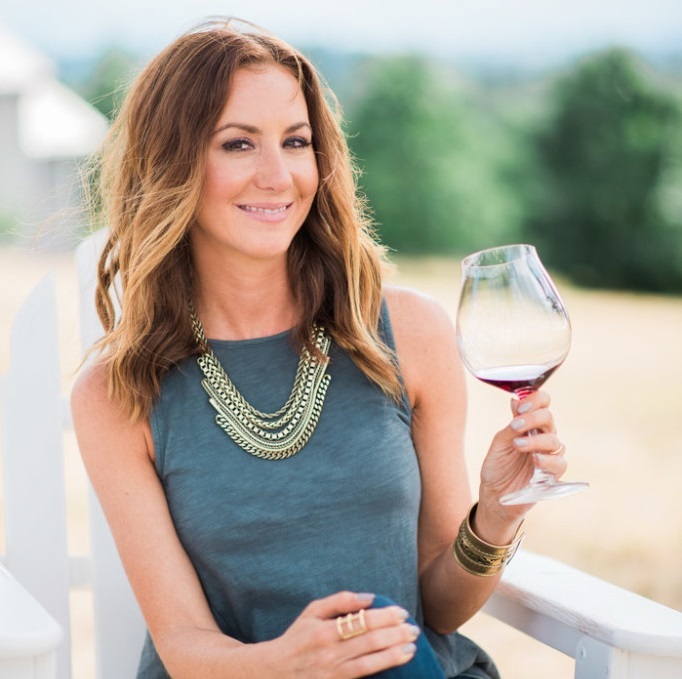 With his Australian accent and vivid enthusiasm for the wine industry, it was awesome to get an insiders perspective on this up and coming wine destination in downtown Eugene. 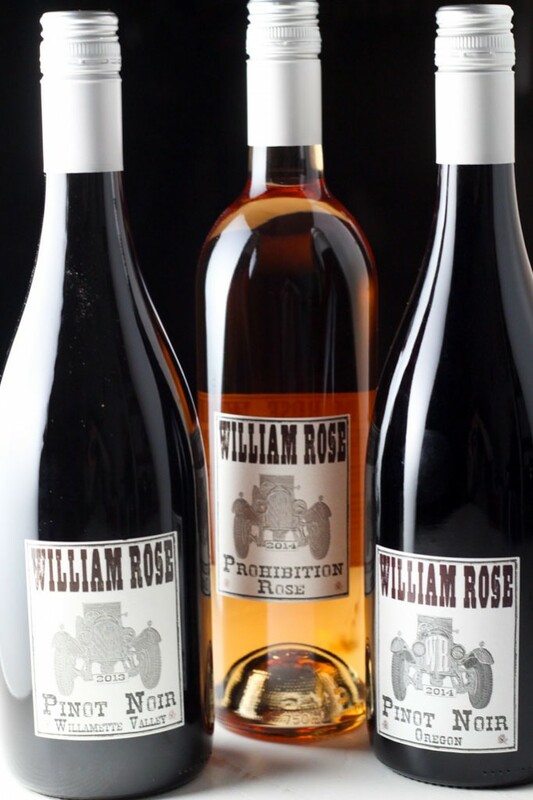 Mark is the on site vintner,making wines under the William Rose Wine label – Pinot Noir, Rose, Merlot and a Syrah-Grenache are just a few of the wines for you to sample. 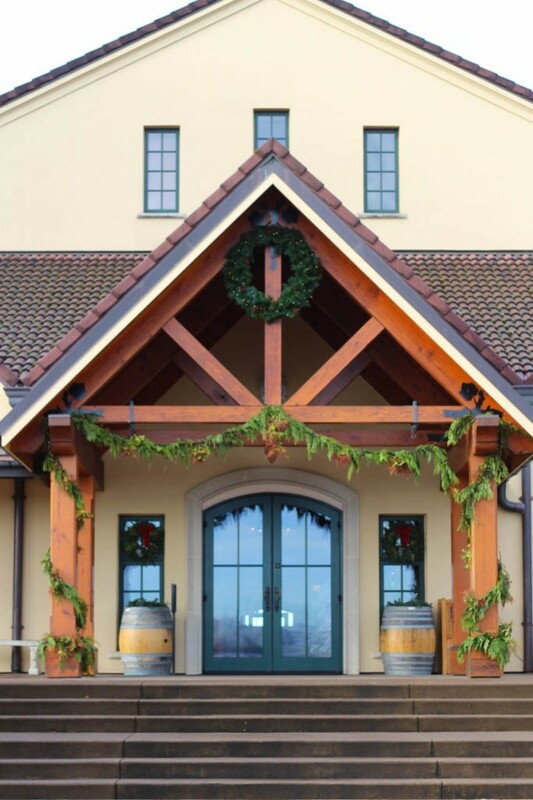 They also pour wines from other local artisan producers, one of our favorites being Spire Mountain Cellars (their Tempranillo is amazing, and recently won a Gold medal at the Grand Harvest Awards). We took home with us a bottle of the William Rose Sangiovese Rose ($18) and the 2013 William Rose Oregon Pinot Noir ($28). 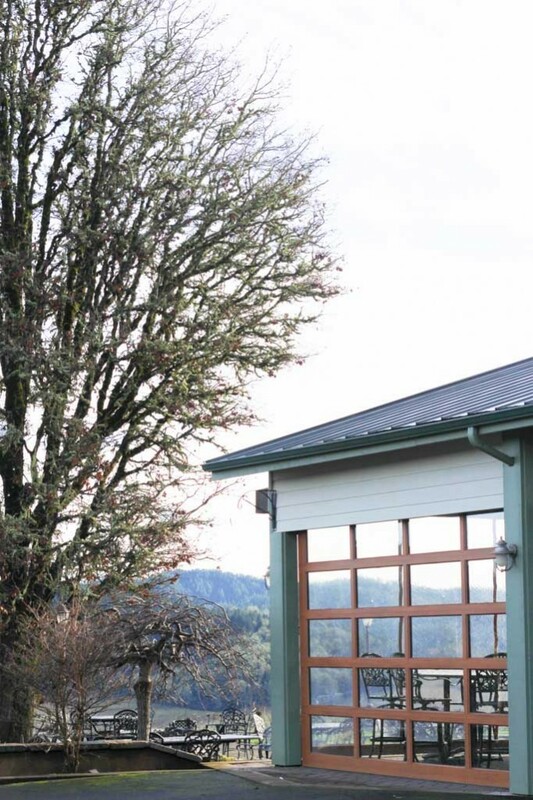 PS – The Oregon Wine LAB hosts live music every Friday evening, and has local food carts on site several times a week. If you’re in the area, I definitely recommend checking out all of these great spots. Also, be sure to visit http://www.eugenecascadescoast.org/ for information on more fun and exciting things to do in the area! Eugene looks just perfect. It does sound like a place that would be lovely to retire to. Love your photos. Keep these tours coming!! Thanks Natasha! 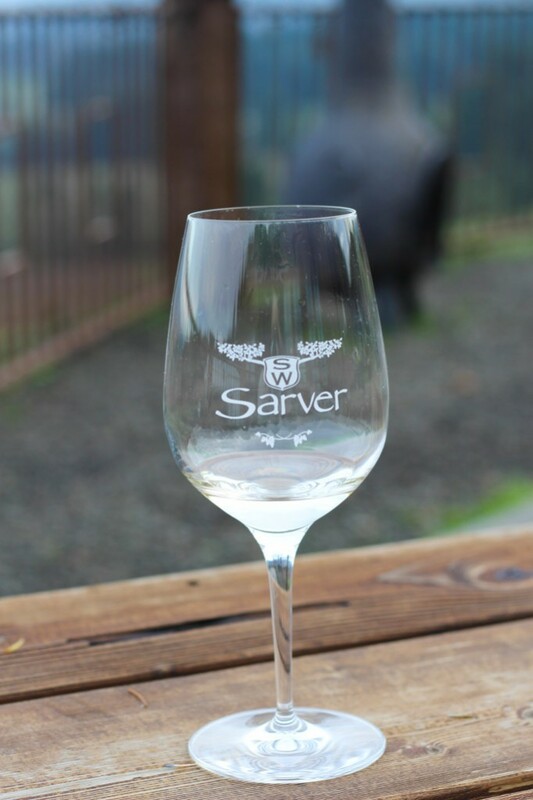 I’ll have several new wine tours posted in the next few weeks – We are going to be BUSY (drinking wine and galavanting about)! I hope you are able to make it back soon Susan! Lots of great spots to visit! What a beautiful place and photos!! Worth going just for the views and food, too, eh? I went to school in Eugene as well and I never miss it… but it is kinda fun when I’ve visited again a couple times. This place looks amazing! 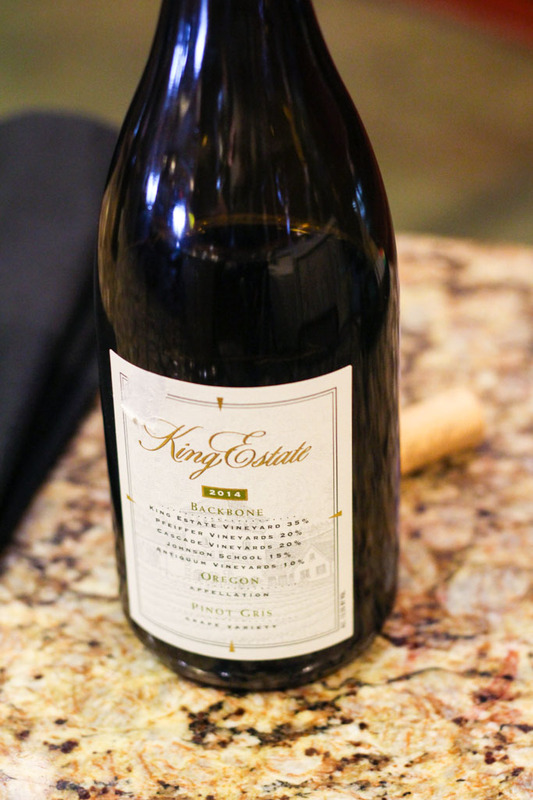 King Estate is fantastic – The food really is as good, if not better, than anyplace I’ve tried here in Portland. I grew up in Eugene and went to the U of O, too! I do love King Estate and Sweet Cheeks, too. Great roundup! Oh man… I love King Estate wine, but I’ve never been there and certainly didn’t know that they had an onsite restaurant. I think I need to make an excuse to travel to Eugene! Beautiful images. You definitely need to plan a visit Jenni – The food is OUTSTANDING! It’s amazing in the summer too, as you can enjoy the views on their patio. Wow, sounds like an amazingly full day of wine tasting. I went to U of O as well, and absolutely love King Estate and Sweet Cheeks! I need to plan a trip back down there and check out some of these newer places! 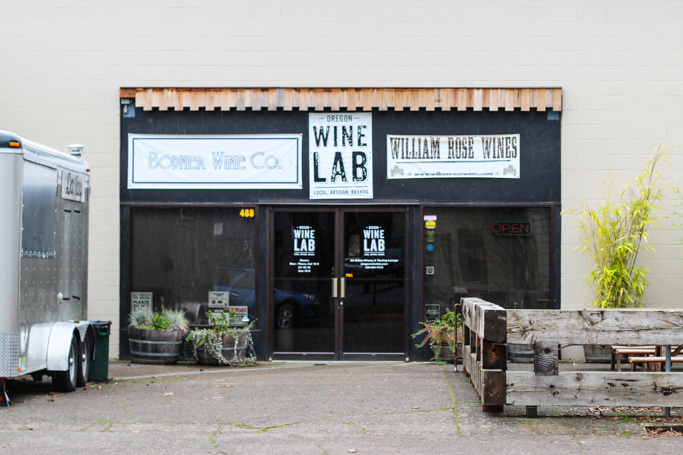 Definitely try to make it to Oregon Wine LAB Brianne – They’re located right in the heart of downtown and are pouring some great wines! Our daughter just started at U of O last fall, so we have at least another few years of trips south. This will definitely be on our list on stops to make! Beautiful photos too, Erin. Thanks SO much Renee – I hope you’re able to visit these great locations! Eugene is a great place with lots of hidden gems! I love Eugene! And I totally agree with King Estate! The restaurant there is outstanding! They also serve some older vintages of Pinot Gris that are super interesting. Isn’t King Estate the best?! It’s one of my favorite things about visiting Eugene.